Looking at a map of Southern Vancouver Island, you'll notice a narrow finger of land flanked by Saanich Inlet on one side and Georgia Strait on the other. This is Saanich Peninsula - otherwise recognizable as the first 20 minutes of your drive to Victoria if arriving via Swartz Bay ferry terminal. If you were to take any of the Patricia Bay Highway off-ramps, you'd soon discover that there's more to this peninsula than simply the pastoral views seen from the highway. Sidney is a walker's town with numerous beautiful routes, from comfortable strolls to longer hikes. Meander down Beacon Avenue, the town's main street - a half-hour amble unless you're a bookworm. (Sidney has over ten bookstores in its tiny town centre!) Enjoy the invigoratingly salty air of the seawalk, from Tulista Park to Lochside Drive. 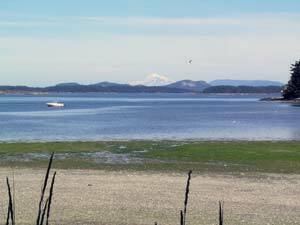 Take in Patricia Bay on the 45-minute Scoter Trail hike. Ogle the impressive yachts and sailboats moored at the beautiful Port Sidney Marina. In fact, Sidney is known for its pleasure craft, with several marine retailers supporting the multi-million dollar industry that decadently bobs here and at several other marinas including Canoe Cove, Van Isle and Deep Cove Marina. The Marina at Deep Cove is particularly picturesque. 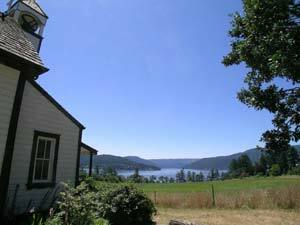 Just north of Sidney, this small but affluent community, with its beautiful properties and deep blue water, is home to the famous Deep Cove Chalet. A favourite dining destination of the vacationing A-List Hollywood set, this unforgettable French restaurant's menu is only rivaled by its exquisite and comprehensive wine-list which features over 18 thousand bottles, some vintages dating as far back as 1902! Sidney's beaches are ideal for day trips. Glass Beach, Patricia Bay, Coles Bay or Island View Beach, a short ferry-ride will even deposit you on Sidney Spit, a tiny isle famous for its camping. If you'd prefer a more interactive experience with the glimmering Strait of Georgia, visit Seaquest Adventures or Emerald City Adventures, the 2 whale-watching outfits that regularly introduce visitors to the Orcas that populate the waters off Vancouver Island's coast. Heading west into North Saanich, the beachfront landscape gives way to rolling farmlands and forests. This pastoral paradise is made accessible by a web of country roads that wind through glades, past parks, hobby farms and roadside fruit & vegetable stands. A day-tripper's dream come true, the area's quiet rural routes and trails are perfect, whether walking, cycling, hiking or on horseback. Over 100 kilometers of scenic pathways meander across the peninsula, connecting the famous Galloping Goose Trail with the rest of the Southern Island. Numerous golf courses dot this magnificent landscape, including Glen Meadow Golf and Country Club, Ardmore Golf Course, Sunshine Hills Golf Course, Cordova Bay Golf Course and Prospect Lake Golf Course. The moderate climate benefits grapes as much as it does golfers. Several vineyards grace the countryside. Take a romantic tour through Chealet Estate Vineyard. This home of hand-crafted specialty wines includes a tasting bar and patio so you can enjoy the tantalizing products on premises, as well as a wine shop so you can take your memories with you. But some Saanich Peninsula's experiences don't involve typical pleasures such as putters or a pinot noir. A famed National Historic Site, The Butchart Gardens is 55-acres of jaw-dropping outdoor show-gardens that attract visitors from across the globe. Enjoy the various aesthetics of each area, from the Sunken Garden set in an abandoned limestone quarry to the zen-ish tranquility of the Japanese Garden. If that's not amazing enough, musical theatre shows and fireworks entertain guests on evenings during the summer season. Butterfly World is an extraordinary adventure for the whole family - a tropical indoor maze of flowering plants, waterfalls and trees that serves as home to a hundreds of free-flying butterflies and moths, representing over 50 species. Other highlights include the dazzling orchid exhibit, the carnivorous plant section and the Koi Fish stream. The facility is also home to a large variety winged visitors from the South African Turocos to the brightly-coloured Flamingos to Amazonian Parrots. Treat your little boy (or just the little boy inside) to an afternoon at the British Columbia Aviation Museum. Adjacent to the Victoria Airport, this space houses many fascinating aircraft, engines, models, artifacts and images - a celebration of Canada's rich aviation heritage from The Royal Flying Corp to the Royal Canadian Air Force. The Sidney, Deep Cove and North Saanich area is a rural-seaside getaway unlike any other - a pastoral postcard definitely worth adding to your collection.